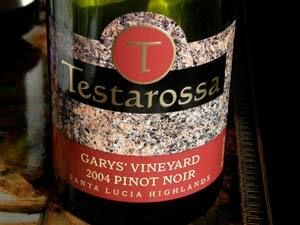 Rob and Diana Jensen founded Testarossa Vineyards in 1993. Today, this is among the largest wineries in the Santa Cruz Mountains, producing 16,000 cases of Pinot Noir, Chardonnay and Syrah. 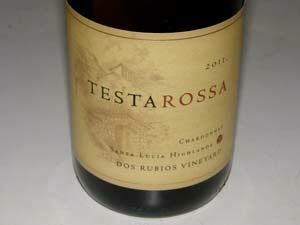 the name, Testarossa, means redhead in Italian, coming from the days red-headed Rob studied in Italy. The winery has a long tradition of distinguished wines sourced from vineyards throughout California. The winery is in downtown Los Gatos at the historic Novitiate Winery built in 1888. The current winemaker is Bill Brosseau. The lineup of single-vineyard Pinot Noirs reads like a who's-who of California Pinot Noir vineyards: Garys', Rosella's, Bien Nacido, Graham Family, La Cruz, Pisoni, Sanford & Benedict, and Sleepy Hollow. the excellent wines are available on the website. Total production is about 14,000 cases annually. A second, value-priced label, Dahlia, is sold exclusively to alcoholic beverage retailer BevMo!